We buy our hair on cowhides in bulk and pass the savings on to you. 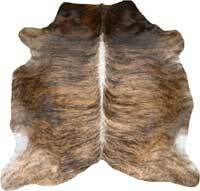 Our hair on cowhides can be used for chaps or cowhide rugs. We take a picture of each individual hide that we sell, so you will receive the same hide that you see in the picture. We stock both medium and large hides, the description of each hide will show the square footage of each hide.